Excellent project management in construction is essential – not only for the best utilisation of labour, materials and equipment across factories and sites, but also for cost-control and time optimisation across your business as a whole. But when you have a number of manufacturing systems to manage, with multiple projects in production, visibility and monitoring can be challenging. 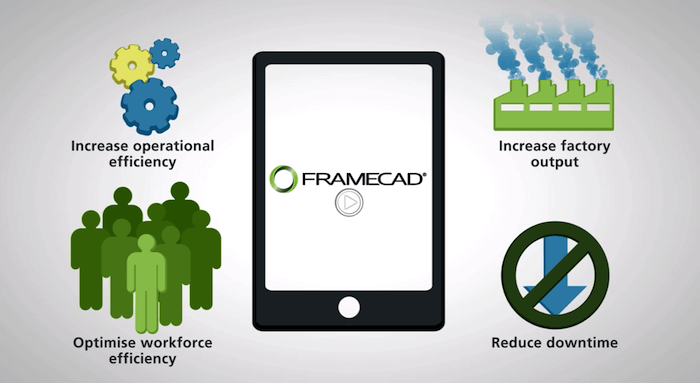 This is why innovative LGS Design and Build system provider, FRAMECAD, has taken the lead in developing a sophisticated online production management portal for its customers. With the innovative My Production feature offered in the MyFRAMECAD cloud-based customer portal, customers have access to production reporting tools and applications to better monitor and improve productivity of their LGS manufacturing facilities and offer better business efficiency. My Production fully integrates with the FRAMECAD manufacturing system(s) to give clients access to the data and insights they need to increase their production output, reduce downtime, improve workforce productivity and increase efficiency across all worksites – from anywhere in the world. Customers can choose to filter by key metrics like Operator, Coil ID or Shifts and also compare multiple manufacturing systems to see how they’re performing against each other. With internet enabled real-time access to data and information, customers can see trends as they develop, allowing them to make informed business decisions based on the data insights they’re seeing. For example, they may find one production team to be less efficient than another by seeing that a much higher percentage of their downtime is spent in assembly. My Production’s calendar overview provides customers with key production statistics and outputs by week or month for their manufacturing systems. Through the calendar they can schedule events and reminders about upcoming activities such as equipment services, project start dates, team meetings and any other activity where team visibility or attendance is important. Through the My Production feature, reporting is easy to understand with clear graphics of key metrics such as production outputs, operating efficiency, tooling usage and downtime summary. Information is also presented in a table view with additional key performance metrics included to provide an in-depth view of a customer’s manufacturing system(s) productivity. All data can be exported for further analysis as required. Customers can view the latest status of their manufacturing equipment including last online time, operator logged in, coil in use and job in production for better traceability. They can even set nicknames for their equipment to easily identify and define shifts that run for each LGS manufacturing equipment system. FRAMECAD is the only LGS manufacturing provider whose equipment is linked to the cloud. Therefore, FRAMECAD is the only provider able to give customers this unique level of visibility across all their production facilities, worksites and operations, as well as precise statistics, data and information. My Production helps FRAMECAD customers turn production data into powerful business insights, gain better control of output and results, and enable them to optimise production from anywhere in the world. Want to know more about how FRAMECAD can benefit your manufacturing operation? Get in touch today.